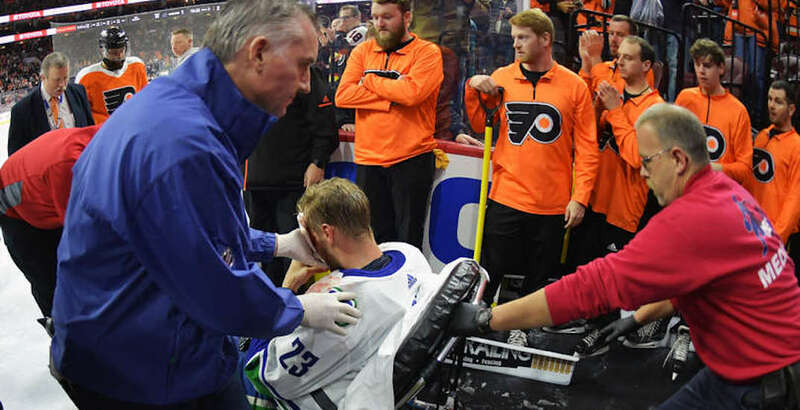 There’s a lot of concern for Alex Edler tonight, after the Canucks defenceman suffered a gruesome injury in Philadelphia. Edler’s stick appeared to get tangled up in the skate of Flyers forward Jakub Voracek, causing him to hit his face on the ice during the third period. Edler laid motionless on the ice momentarily, bleeding profusely. Players from both teams signalled for the trainers right away, clearly worried about Edler’s condition. Edler was taken off the ice in a stretcher, though he was conscious. Sportsnet’s Dan Murphy reports that he saw Edler walking outside of the team’s medical room, as opposed to being carted to hospital, so that is a positive sign. Saw Edler in a track suit walking out of medical room. Waiting for update from Travis Green. Head coach Travis Green said Edler went for x-rays on his face, but didn’t have anything more specific to share. He will not travel with the team to Washington for Tuesday’s game. Vancouver lost the game 2-1, with Brock Boeser scoring the lone Canucks goal.